Satellite maps of the world from 10km to 1 meter resolution are available for scientific earth analysis, situational awareness applications or as backdrops for composite map making. 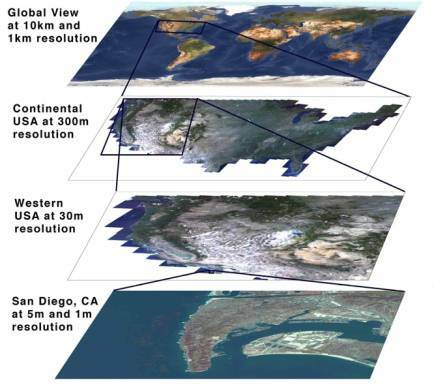 Position Integrity imagery is derived from many sources, included the Advanced Very High Resolution Radiometry (AVHRR) sensor, Landsat, SPOT, Ikonos, NIMA CIB and most recently from the Shuttle Radar Topography Mission (SRTM). We have developed automated mosaics and auto-registration software to create seamless multi-spectral coverage of the world. Our feathering algorithms allow scenes to be joined without the usual boundary artifacts. Named for it use on the NASA Shuttle Endeavour STS-99 which flew in February 2000, this electronic collection of imagery plates is an example of medium to cource-resolution data available through Position Integrity. This particular dataset guided the astronauts on their 11 day mission to map the earth's terrain. The Astronaut's Atlas is a global mosaic of Advanced Very High Resolution Radiometry (AVHRR) images georeferenced to form a seamless and cloud free map of the world. The dataset is cast in the Platte Carre projection and makes use of our advanced GeoTIFF graphic format technology. The underlying resolution is better than 1 KM per pixel. Scientific advances were made by the NASA/Jet Propulsion Laboratory (JPL) to process the AVHRR imagery into a usable dataset for aeronautical navigators, segment the overall mosaic into 36 pieces and add text representing selective cities over the base imagery. The 36 pieces are each represented by a map segment, with each map segment being 50 degrees high by 30 degrees wide. Our free moving map application, the Digital Aviator will display these map segments in the VFR Window and can provide the pilot with an astonishingly clear view of our planet. For more information on the pending availability of this dataset, please contact us by telephone or email.